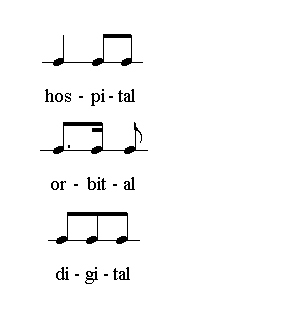 I wonder whether the difference can be (partly) attributed to the use of a voiceless consonant (actually a voiceless consonant cluster) preceding the vowel before -tal in hospital, and voiced consonants preceding the vowel before -tal in both orbital and digital. I can’t think why that would make a difference, but might it? Mhhm – maybe some kind of dissimilation? Graham, there is nothing the least bit odd about the grammar of that! In the blog entry you link to, JWL is talking about the on-line pronunciation dictionary howjsay.com. He says that the pronunciations there of the examples hospital, pyramidal and orbital, of which the first is pronounced with final -dl, “all sound okay, despite the dictionaries”, which do not show that hospital “most usually has in British usage final /-dl/, like the second and not like the third”. I’m sure you have seen on John Wells’s blog that he has taken issue with the pronunciation ærɪsˈtɒtl for “Aristotle” given by that on-line pronunciation dictionary, saying that ˈærɪstɒtl is the only stress pattern he shows in LPD, and that he still thought ærɪsˈtɒtl was “simply an error” (Aristotle, 28 January 2010). I posted a comment on that blog entry saying that JWL’s admiration for the heroism of the howjsay enterprise seemed to have made him less critical than JW, though presumably he had not lit on “Aristotle”, on which I should have thought we could all agree, but there were other things about the pronunciations on that site which neither JWL nor I was entirely enthusiastic about. I thought that JWL was certainly right to say “French items are at times too French to be realistic models for users of English”, but among the more realistic he includes “kʀiː də `kɜː”. That would already be UNrealistic for French, which is “cri du coeur”, but what I hear on howjsay is [kʀi də ˈkœːʀ] which is even more absurd. And along with a miscellany of other pronunciations I checked on that site, I don’t actually think ˈhɒspɪdl is one of the “very suitable EFL targets” in connection with which JWL mentions it, and this is no doubt one of the reasons why not only the British dictionaries he mentioned but all the dictionaries I have been able to find on or off line do not show it, including the ones that note the differences between Br and US pronunciations with sometimes unnecessary precision. Perhaps the ones which note them with unnecessary IMprecision, like the Oxford American Dictionary and Oxford Dictionary of Pronunciation for Current English may show it for the US, as they do use d quite indiscriminately instead of t̬ or ɾ, which is one of the reasons I have demurred to get copies. Examples of relatively sensible transcriptions for US English are to be found in the Cambridge Dictionary of American English (ˈhɑsˌpɪt̬ᵊl) and the Cambridge International Dictionary of English (ˈhɑː.spɪ.t̬̬əl). The online dictionaries which provide sound files also all have pronunciations with the allophones t̬ or ɾ rather than d, including Wiktionary, which is usually the most up to date. I don’t think hospiddle can have been around all that long: I say ˈhɒspɪtl and my mother (93) must have done so from near-infancy, as the tale was always told of how she called it the horse bottle. Like Martin I too thought the different behaviour of your examples ‘hospital’ ‘orbital’ and ‘digital’ might be due to dissimilation, but the parallel with Italian ospedale vs orbitale and digitale, made me think it might be more likely to be because ‘hospital’ is of greater antiquity and familiarity than the other two, at least in their current main senses. My aerial man says ˈdɪdʒɪkl, and I have certainly heard ˈhɒspɪkl. Anyone heard ˈhɒspɪɡl? PS The Oxford Dictionary of Pronunciation for Current English has -tɒdəl for US Aristotle, which was one of the driving forces for my above rant, for which I apologize, but would plead that it was all strictly on topic! Regarding Graham’s suggestion that /hɒspɪdl/ as opposed to /ɔbɪtl/ etc might have a rhythmic basis I dont find convincing. Michael Lamb’s idea that the difference is “because ‘hospital’ is of greater antiquity and familiarity” seems to me exactly the case. After all, Gen Am has voiced all such original /t/s. And ML’s comparison with Italian ospedale and orbitale supplies a very telling one. Another difference between hospital and both orbital and digital is that the two latter are both adjectives, while hospital is a noun, so there is a morphological boundary between –it– and –al in these, but not in hospital. Graham, since hospital is also originally an adjective with a morphological boundary between -it- and –al, I take you to be thinking in purely synchronic terms, i.e. the past century, as to be certain the original adjective hospital was dead, and any adjectival hospitals we were dealing with were derived from the noun hospital, we would have to go back at least a century. hospitable, hospitality (independent derivation and semantic identity), hospitary, hospiticide, hospitize, and their various forms. digitate a and v (just about), digiti-, digitin (not really), digitize, and their various forms. Not much in it really, is there? It doesn’t exactly look as if orbit and digit are any more morphologically productive. About the only thing you can say is that hospit- is bound and they’re not, but even that is only because of its higher profile resulting in the form ‘host’!